There is a noticeably growing shift in business attitudes towards models and methods that seek to meet our needs without destroying our fragile ecosystems. Businesses now realise the need to care for the wellbeing of people, and the finite resources of the planet as well as returning profits for them and their shareholders. Sustainable businesses consider the whole life-cycle of their product, turning waste into a new resource, and choose renewable energy as the standard. in the Private and Public Sector - Through Consultancy, Events and Services. The Expo is looking to form a partnership with an organisation or individual as a valued Patron for the largest event of its type in the region. The Big Sustainability Expo 2019 Keynote Speaker Theatre sponsorship is 'up for grabs' and puts your organisation in front of our visiting delegates. 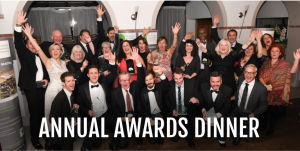 The 2019 Big Green Awards will again celebrate what's being achieved in Corporate Sustainability, Environmental Management and Social Value. Secure your own award category today. 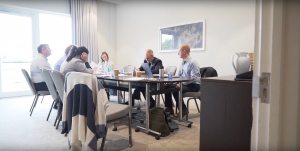 The Southern Sustainability Partnership has been instrumental in both supporting the Council’s agenda of positioning Bournemouth and the wider region as a Green Economy Leader, and in providing a platform for businesses across the South to showcase their sustainability credentials. The Big Sustainability Expo is an excellent showcase of technology and knowledge from across the region and is gaining wide recognition as a leading industry event. 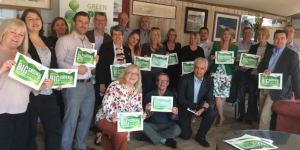 The Big Green Awards was an excellent addition this year, helping to bring pride and profile to those of us who are making great strides in being sustainable organisations. Keep up the excellent work. This is the one regional event I always try and support. Well organised, well thought through and purposeful. Our recycling charity, based in Poole - Dorset, has really appreciated the interest and support that The Southern Sustainability Partnership has given us. Especially attending their Expo, where we received so many positive comments from visitors to our stand. 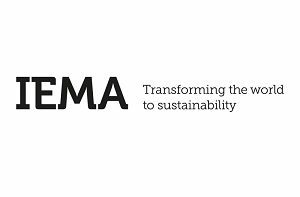 We may not be the biggest player in the world of sustainability, but thanks to The Southern Sustainability Partnership, their enthusiasm for our work has ensured our name and projects have been heard by new audiences and we very much appreciate this. It's great to work with TSSP and, it’s very much worth pointing out, that they are extraordinary organisers and their events attract the right kind of people and organisations towards making the world a better place. We are delighted to work with The Southern Sustainability Partnership as we share the same ethos and values. 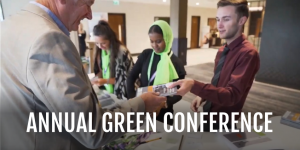 We attended the Big Green Event Expo in October 2018 and can honestly say this is the best b2b event we have ever attended. We have met lots of new connections as part of our relationship and looking to growing this further. The Big Green Event Expo has been a fantastic opportunity to showcase leading sustainability practice and green technology. The Southern Sustainability Partnership has been key to the event’s continuing success. The Southern Sustainability Partnership enables organisations to learn about Sustainability issues and opportunities from some very knowledgeable speakers, make contact with other like-minded people to share experiences and ideas - and provide support to each other. I attend the Big Sustainable Expo each year and have always learnt new things and met really interesting and useful suppliers and contacts. The site visits have helped me see ideas in action and the events provide the ideal opportunity to learn from both the speakers and the experiences of peers. They are a local company to us that really understand and help organisations deal with the local, national and global sustainability agenda. I’m a huge supporter of The Southern Sustainability Partnership and its Big Sustainability Expo. We must all contribute to seeking a greener and more sustainable way of life. Businesses, both big and small, have a key role to play in this and in order to meet their full potential, I would urge them to work in partnership with The Southern Sustainability Partnership and, also, to attend the Big Sustainability Expo. The Southern Sustainability Partnership offers my business a well-rounded calendar of events. The Green Supplier Hub has been instrumental in us forming partnerships which have opened new doors. We exhibit at the Expo each year to raise awareness for our solutions, which has proved extremely successful. As MD, I have taken time to work on the business by attending the conference. This has helped me understand the way we run our own organisation fits perfectly into a Circular Economy model as we design our own waste compaction systems, build them on-site and offer maintenance and equipment return system. We were delighted to be honoured with the Waste and Recycling Solution Award at the Big Green Awards last year. The Southern Sustainability Partnership has been a great help to us by introducing us not only to new customers but also into a network of like-minded professionals. We have made several new business contacts which have enabled us to broaden our knowledge of the industry and to refer them on to our customers. Being one of the early members of The Southern Sustainability Partnership I strongly believe it has helped our business. The partnership is not only about the very useful events but also about meeting business owners and employees whose hearts beat for the environment and, hence, are honest and hardworking partners for you in your projects. Friends and associates you find within this group of people are to count on. Those I have had the pleasure to work with really go the extra mile to fulfil your customer’s requirements and give them a trustworthy impression. All this is thanks to the hard work and dedication of the Southern Sustainability team who do not spare any effort in supporting your business. The GHS Group has worked alongside Anita and Lynda for nearly 2 years. When we first came across the Southern Sustainably Partnership is was so refreshing to find people that realised they couldn't change the World overnight, but by working together and all making small improvements we can actually make a far bigger impact. We've since been introduce to like-minded people and quickly forged trusting relationships that have made working on projects together easy and enjoyable. If you're thinking you would like to be a greener business I can only recommend you contact these two great ladies and see how you can fit in. 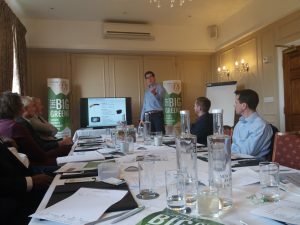 Turn up for a couple of Green Supplier Hub meetings and you'll quickly learn there are some great businesses in this room that all want to help. I can only recommend the SSP and their events. Sustainable Business Conference 2019: I thought it was a great day, really interesting and an interesting mix of people/businesses so well done again for organising. I found the Sustainability Business Conference 2019 insightful and very productive. The event was well organised with a sufficient number of attendees to make it very interactive and personal. The workshops were a great way to get everyone talking about sustainability within their workplace and share best practice. It was also a clever way of breaking the traditional format of seminars. It was helped by having two very knowledgeable and friendly individuals from Terrafiniti who made us feel relaxed during the workshops. I will definitely be attending future events run by Southern Sustainability Partnership knowing that it will benefit my sustainability journey. 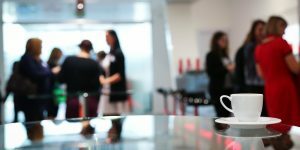 Sustainability Business Conference 2019: A fascinating event that will no doubt grow over the years to come – you are doing really well, you should be very proud! Working to facilitate best practice in the private and public sector, helping create sustainable stability and growth.